A couple of openings to mention; The Corner Crepiere on the corner of 24th and Chicago is aiming to open the first week in December. Their hours will be from 7 a.m. to 7 p.m. They will offer savory and dessert crepes along with a coffee bar. Also, Tommy Colina’s Kitchen is opening their west location the first week in December as well. They will launch a new happy hour menu at the new location. You can follow their progress at www.facebook.com/tommycolinaskitchen. Give unique gifts this holiday season. 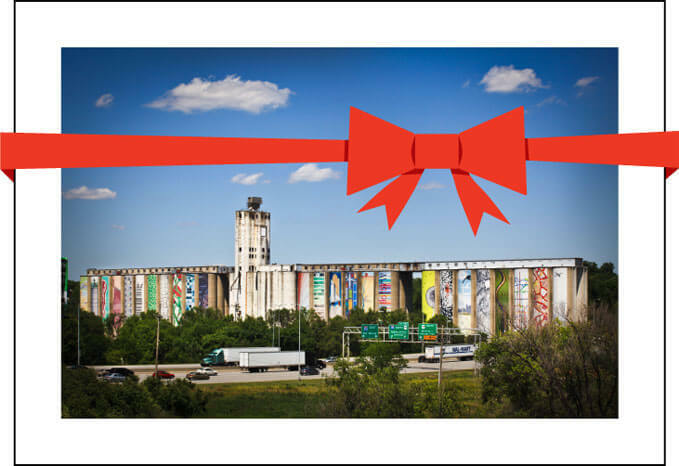 You can get prints of your favorite Stored Potential banners or a photo of the art-covered grain elevator. Pick up a tote bag made from an art banner or a set of postcards showing Emerging Terrain’s community projects. Or give yourself a gift. It all supports Emerging Terrain’s ongoing work. · Old Chicago Black Diamond Porter – a unique style only available at Old Chicago, this beer was designed and created by Old Chicago and brewed at Boulder Beer Company. · Sam Smith Winter Welcome Ale – the first imported winter seasonal beer brought to the United States in 1990. · Leinenkugel Snowdrift Vanilla Porter – a new seasonal offering brewed with seven malts and aged on real vanilla. · Stella Artois – initially launched as a seasonal beer especially for the Christmas holiday in 1926. · Widmer Brrr – a red ale with a malty sweet finish from Widmer Brothers in Portland. · Odell Isolation Ale – a subtle crisp hop finish balances this sweet caramel malty ale from Fort Collins, Colorado. · Boulder Beer Never Summer Ale – a medium-bodied ale brewed with dark caramel malt and a high level of hops. · Sam Adams Winter Lager – a deep ruby lager with a touch of holiday spice. Old ChicagoWorld Beer Tour members who complete the Winter Mini Tour will receive a limited edition long-sleeved Mini Tour t-shirt. All guests ages 21 and up are invited to become World Beer Tour members at Old Chicago or may register online at www.oldchicago.com.